The World’s Leading Consulting House McKinsey & Company offers a tremendous boost for the Winner of the MPIDEA Competition! Innovations are the basis for Finland’s growth and the creation of new jobs and welfare. The manufacturing industry has built a foundation for Finland’s welfare, which the world’s leading consulting company McKinsey & Company wants to both support and expand. ‘We want to support the MPIDEA competition in a significant way because this type of contest is important on a national level. Renewal is vital, in many ways. Through our own work we support and improve the competitiveness of those companies that have been building Finnish welfare. At the same time, Finland needs new businesses, and the MPIDEA competition is a great fit for this purpose’, states McKinsey’s Senior Partner Lari Hämäläinen. Finland should not settle but instead strive for the top and the same goes for the participants of the MPIDEA competition. ‘We will do our best to help create more globally successful Finnish companies’, emphasizes Hämäläinen. Now if ever is the time to put effort into the competition entry because the MPIDEA competition is open to all. Any creative idea, innovation, product or service that can create jobs in Finland is welcome. 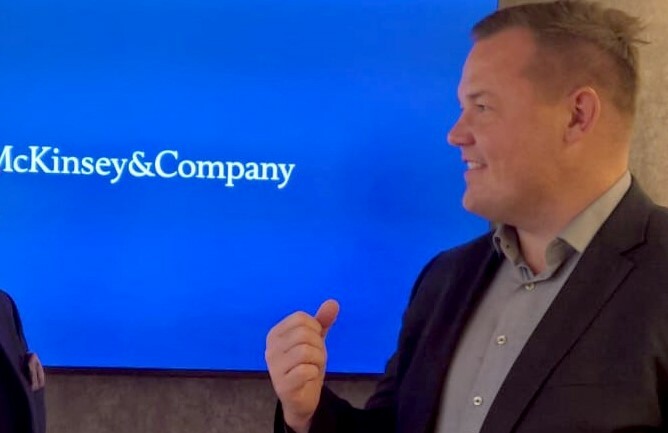 The sky is the limit for the winner as the prize is a McKinsey service that is used by leading Finnish and international companies. ‘We are offering the winning team access to our 5-month long Growth Accelerator Program. In the first stage of the program our business experts will help develop the winner’s business idea. We will strongly spar the winner’s go-to-market plan’, Hämäläinen describes the opportunity for the winner to experience an upward trajectory. ‘The second element of the prize is the coaching we offer; we provide tools for improving the performance of the winning team. Leadership training is an important part of the package’, states Hämäläinen, who is eagerly waiting for the competition’s winner to be announced and for the prize program to start. ‘This is important for Finland and a great thing for us. We are excited to be able to work with you!’, Hämälainen already sends greetings to the future winner. The industry invites everyone to innovate! The MPIDEA competition culminates at Finland’s biggest industrial event MPD at the start of June. The winner will be announced at the final in Tampere’s Tähtiareena 5.6.2019. ‘We are very satisfied as we proceed towards the final. We have an amazing main prize on offer because McKinsey is able to provide the winner with the ingredients to rise to the top of the world. In addition, we have a great team of judges lead by Juho Romakkaniemi. The winner’s omen looks promising! After winning the MPIDEA competition in 2017 with its industrial dryer ModHeat, SFTec has been chosen, among others, as one of the government’s top projects’, rejoices Harri Kulmala, CEO of DIMECC Ltd.
DIMECC Ltd, Finland’s leading ecosystem for digitalizing manufacturing industries, is organizing the MPIDEA competition on behalf of the industry, together with the MPD partners including McKinsey & Company. MPIDEA competition website: http://mpdays.com/MPIDEA and competition registration form.